Brrrr, it’s cold down here in southern Australia this week. So I continue to at least think warm by posting some more images from Queensland. For this post I jump back to a prior visit from July last year. I rather like cityscape/architectural images taken at the end of the day when the evening light lifts an image out of the ordinary. 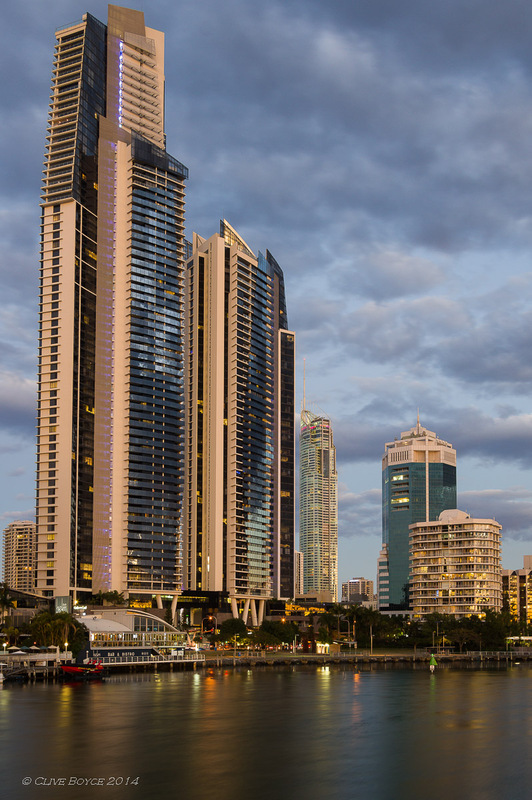 Here’s a few images taken in pursuit of that style featuring Surfers Paradise’s highrise apartment towers. Pentax K-3 camera + Cullman Nanomax 260 tripod. It was a nice still night so I had a bit of a play about swapping between the lenses I packed in the camera bag for the trip up to Queensland. The first three images were taken with my current walkabout lens, the Pentax FA 20-35 F4, the 4th image was with a Pentax FA 43mm F1.9 Limited and the 5th with a Pentax FA 31mm F1.8 Limited. Just love the quality of the starburst just to the right of centre in the FA 31 image. This lens is right up there with the Pentax FA 77mm F1.8 Limited for the starbursts it can create (click here to see an example of the FA 77’s output) . Mental note to self to use both more often with night scenes. All five were taken on the same evening and presented in chronological order, illustrating the variety of moods that can be captured by staying with the subject as the light fades away. I see so many people take a snap of the sunset and then put their cameras (or these days more often than not, their phones) away, unaware that the 30 to 45 minutes or so following the sunset can deliver some great photographic opportunities. The trick is to pre-plan in order to be in the right spot at the right time. If not more or less in the right location first up, then the ideal lighting may well come and go quicker than you can scout out an alternative viewpoint. All of the images in this post were taken within a 50 minute period and while I changed locations during this time, I had the benefit of my friend’s local knowledge to deliver me to the right places. The evening’s technical challenge for the later images was that there were a few tourist canal cruise boats wandering about. The boat wakes disturbed the reflections while their navigation lights left light trails across the images. It took a few takes to get the desired boat free results. 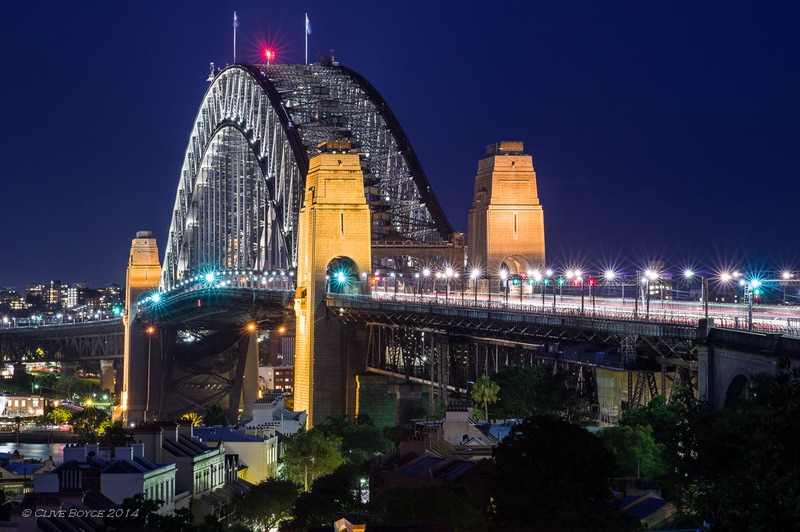 I had a 18 inch by 12 inch print of the photo taken with the FA 31 made up before my recent trip back to the Gold Coast and took it up there as a present for my friend. I must say the print looked fabulous. The photo lab, a small specialist outlet, also thought the print looked good, so much so that they asked if the image could be published in their newsletter as customer photo of the month. On this occasion at least, it’s not me blowing my own trumpet! If this post inspires you to attempt something similar on a visit to the Gold Coast, then the red pin on the map below is where the later evening images were taken from. 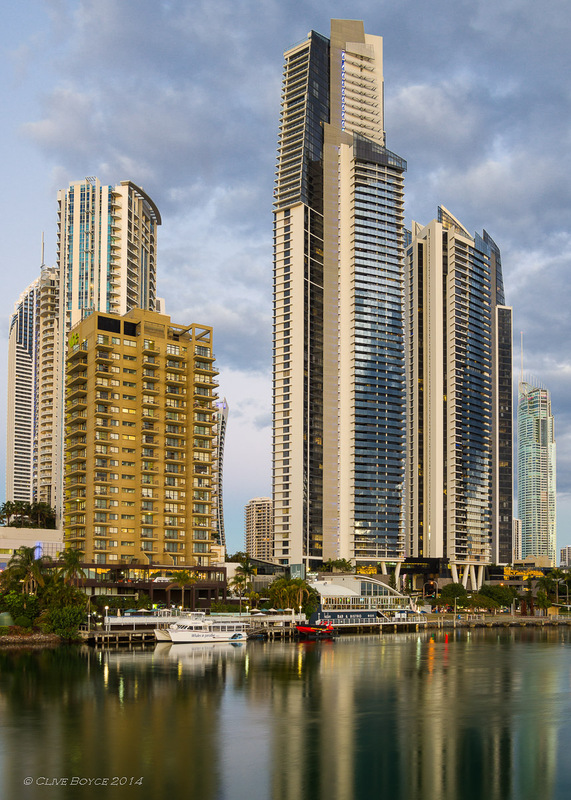 The first two images were taken on the bridge leading onto Chevron Island from the Gold Coast Highway. 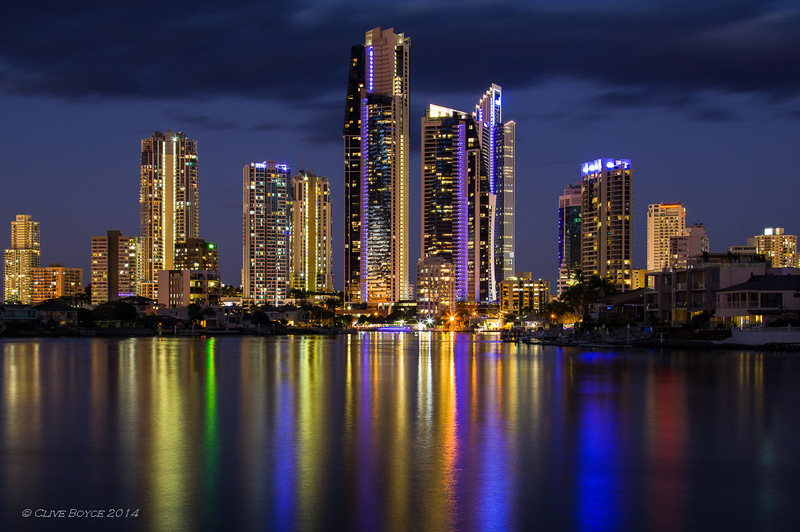 Other Photo Morsels Queensland posts can be found here. 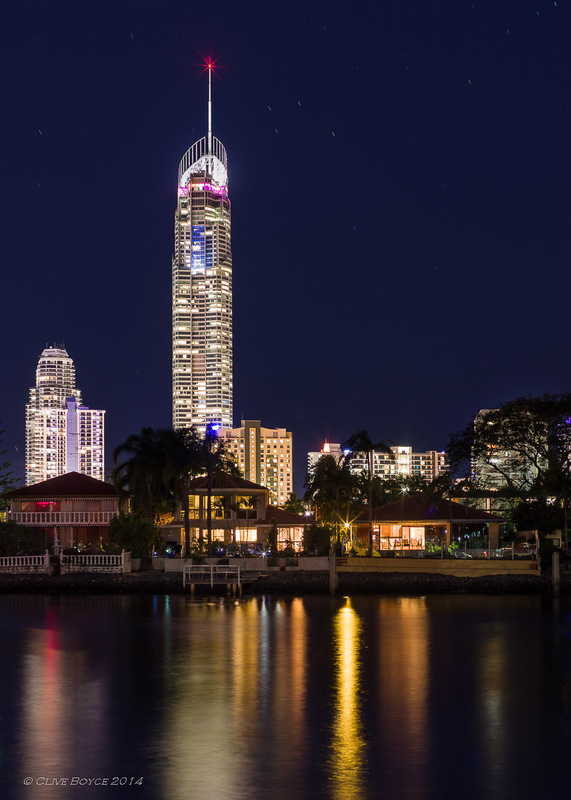 This entry was posted in Australia, Other States, Places to Visit, Queensland and tagged Gold Coast, Night Photography, places to visit, Queensland, Surfers Paradise on July 14, 2015 by aussiesouthlander. 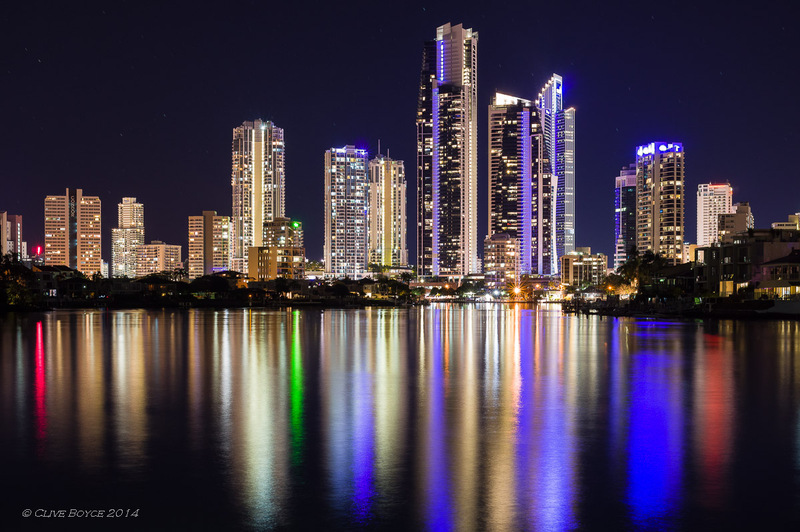 I quite like the last picture, the night shot with the reflexion of the buildings on the water, it’s quite beautiful ! Sorry I took so long to spot and approve your comment!